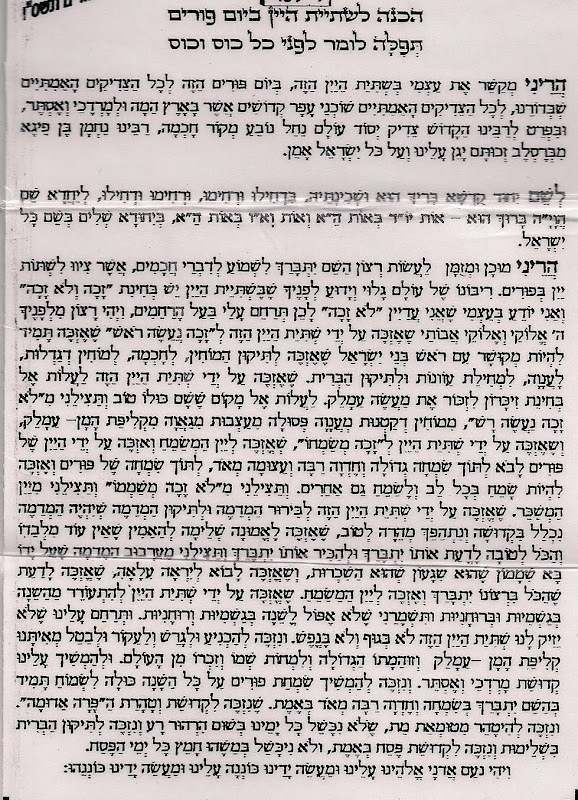 Below is the secret tefillah of drinking b'kedusah, drinking in a holy way, on Purim. All know that it's considered a mitzvah to drink until "ad lo yada", until one doesn't know the difference between blessed is Mordechai and cursed is Haman. Unfortunately without proper intention and focus this can both be dangerous (physically) and easily develop into an inappropriate drunken binder. I accept upon myself to drink this cup of wine (the preferred drink to use for Purim is specifically wine) on this Purim day in the name of all the true tzadikim of the generations, for all the true tzaddikim who reside in the holy dust (here) in the Holy Land, and to Mordechai and Esther, and especially to our holy Rebbe (Rebbe Nachman of Breslev), the tzadik is the foundation of the world and the fount of wisdom, our Rebbe Nachman son of Fayga from Bresle, his merit should protect us and all Israel, Amein. In the name of the union of the Holy Oe, blessed be He, with His Shechina, to united the Name yud-kay with vav-kay in a perfect union in the name of all Israel. I am prepared to invite the will of Hashem to fulfill the will of the Holy One, Blessed be He, and to listen to the words of (our holy) sages, which have commanded us to drink wine on Purim. The Master of the Universe has revealed and shown that by drinking the wine there is the merited and not merited, and I know that by myself I am still not worthy. Therefore I request this mercy upon myself: Master of Mercy, may it be your will, G-d and G-d of my fathers, that by drinking this wine the following merits will come upon my intellect - that I will merit to constantly by connected to the (true) leaders of Israel, that I will merit (tikun hamochin) intellectual corrections, wisdom, that my arrogance will be removed, that I will be humble, to repair my sins and especially (tikun habris) sins relating to the bris milah. A safe and happy Purim!